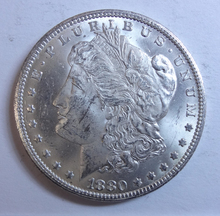 This is the second installment about the need for coin auctioneers to understand grading. The first listed the Do’s and Don’ts of grading. This cites houses that described raw coins so accurately that PCGS, the most rigorous holdering company in the business, agreed with their grades when Proxiblog sent the coins in for authentication. Silvertowne: 1880-CC. Lot desccribed coin as MS62-63; coin returned by PCGS, MS62. Matthew Bullock Auctioneers: 1883-O MS64DMPL; coin returned by PCGS, MS64DMPL. 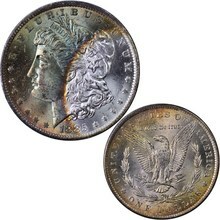 Leonard Auction: 1903 PCGS Old Green Holder, MS64, possible upgrade; coin returned by PCGS, MS65. Capitol Coin Auction: 1885-O, rainbow color, MS63; coin returned by PCGS MS63. Fox Valley Coins: 1991-CC, MS64; coin returned by PCGS, MS64. 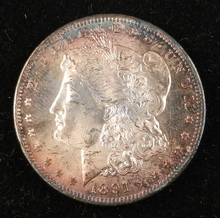 We have had similar luck with certain auctions sending to NGC, among them, Manor Auctions, Kreuger and Kreuger, Key Date Coins and Engstrom Auction. We have come close on occasion at NGC or PCGS (within a point) with Western, Weaver, Arneson, Meares, Scott and Kaufman auctions. 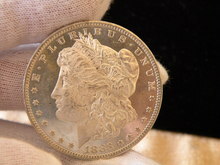 This entry was posted in Articles, Uncategorized and tagged American Numismatic Association, Arneson Auctions, Auctioneers, AuctionZip, Best Practices, Capitol Coin Auction, Coin Auction, Engstrom, Fox Valley Coins, Grading, iCollector, Kauf, Key Date Coins, Krueger Auctions, Manor Auction, Mathew Bullock Auctioneers, Meares Auction Group, National Auctioneer Association, NGC, PCGS, Proxibid, Proxiblog, Scott Auctions, Silvertowne Auction, Weaver Signature Coin and Currency Auction, Western Auction. Bookmark the permalink. ← Improve Your Grading Skills!